Add a touch of elegance to one of the most memorable occasions of your life. 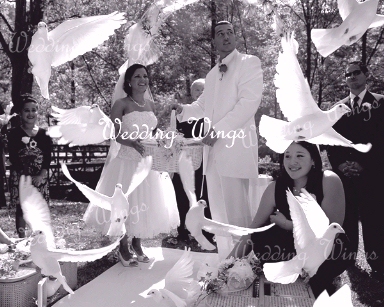 WEDDING WINGS, based out of Bridgeport, West Virginia, offers the professional release of WHITE DOVES to make any Chapel Wedding, Garden Wedding or Reception a breath taking experience for you and your guests. We coordinate the release of doves with the photographer allowing you to capture the special event and savor the memories forever. Congratulations!!! It appears that you are planning a very special day in the near future. When planning for that special day, brides-to-be often search for something unique that will set their wedding apart from the traditional wedding. If you happen to be in West Virginia, something to consider would be an elegant white dove release done by Wedding Wings. At the conclusion of the traditional wedding ceremony, the crowd awaits the Bride and Groom to exit the church and then showers them with rice or bird seed. Often a cluster of balloons is released by the crowd. Imagine this: The wedding ceremony has concluded. The guests are gathered outside of the church awaiting the bride and groom's appearance. After exiting the church, you are handed a beautiful decorative basket by your bridesmaid that contains two pure white doves. As the crowd anxiously awaits, you and the groom open the lid of the basket and the two beautiful white doves begin their flight. The white doves symbolize the beauty of this day and the commitments that you each have made. They also represent the two of you departing to begin your new life. After the two doves are in flight, a flock of doves is released among the crowd. The flock of doves raises to the sky and unites with the two birds that were previously released. The crowd stands amazed by the noise of the wings and the absolute beauty of the white doves as they reach for the sky. The flock of doves circles the area briefly sparkling among the clouds and blue sky, allowing your crowd to admire their beauty. For classy white dove releases in West Virginia, be sure to look up Wedding Wings!